Producing cloud seeding particles from ground level for weather modification purposes is not only possible, but regularly practiced. Supplying the colossal quantities of water needed to form, fuel, an feed even the smallest of precipitation events, is another matter altogether. I have had a number of people request that I address the completely false information / conclusions being propagated (by some sources and individuals) who are stating that power plant cooling towers are being used as a primary or major source of atmospheric moisture for climate modification. I have not written about this disinformation until now as the cooling tower conclusion is so ludicrous and so mathematically impossible that I felt it did not actually need to be "debunked". This being said, some published photos and videos (with completely false conclusions) of the steam plumes above cooling towers could lead to confusion for those that have not actually investigated or done the math. Why is it so important to set the record straight in regard to the "cooling towers supplying water for storms" disinformation? Because such patently false narratives completely discredit the anti-geoengineering community as a whole. If we lose credibility we lose any chance of academia joining us in this critical battle. We cannot prevail in this fight without uniting many factions of society in the effort. If we lose the battle to expose and halt climate engineering, all is lost. Power plant cooling towers are comparable to the radiator on a car. The towers and associated components are designed to keep power generation equipment within standard operating temperature ranges. 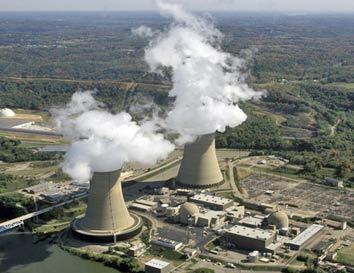 I have personally worked on cooling towers for Bechtel Power over three decades ago. The facility I was involved with was the "Coolwater Coal Gassification Project" located in Dagget, California. Dagget is in the middle of the Mojave Desert. How much available water is there in this desert? Very little, and for this reason these cooling towers were a "closed loop" system (the cooling tower water is recycled). 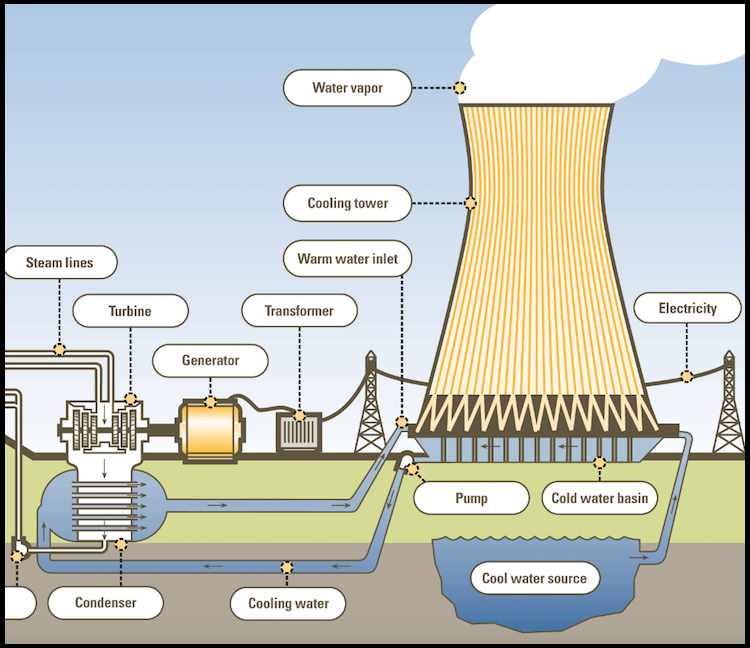 An ever increasing number of power plants use the "closed loop" system in order to conserve water. Further, many power plants now use "Dry Cooling" systems that lose almost no water to the atmosphere. 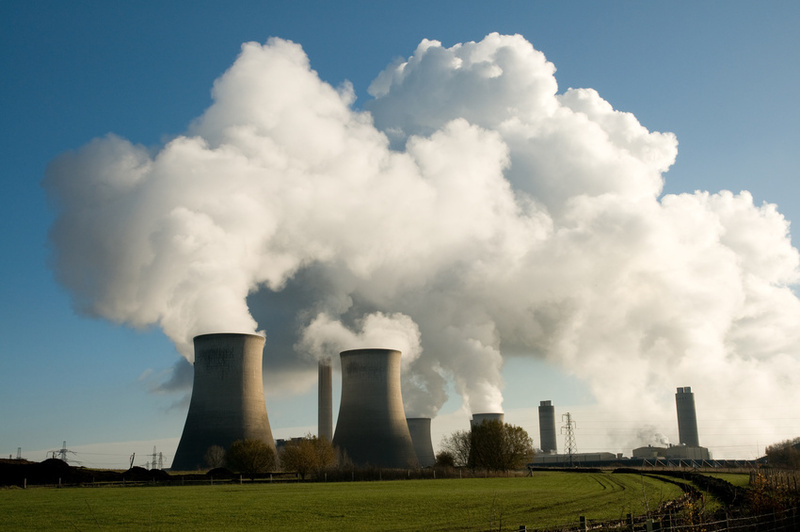 Though many power plants do use steam turban generators, the actual volume of water lost to the atmosphere is minimal. In comparison to even the smallest of rainstorms, the amount of water vapor put out by power plant cooling towers is completely insignificant. As already mentioned, most cooling tower facilities simply recirculate the water, only losing a slight amount to the atmosphere. Though the steam plumes they emit may seem substantial, the moisture content they emit is, again, insignificant and meaningless from an atmospheric perspective. 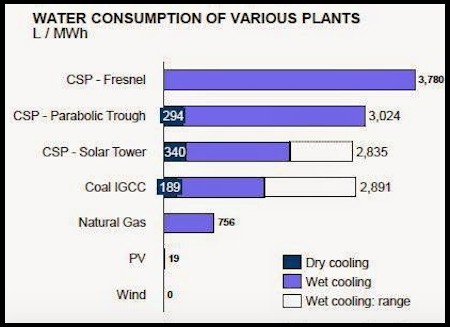 The graph below shows the amount of water consumed in various of power plants with cooling tower facilities. The consumption is shown in "Liters per Mega Watt hours". If we convert liters to gallons, even the most water intensive power plants still use only about 1000 gallons per Mega Watt hour (while most other facilities use much less). Now consider that only 1 inch of rain over only 1 square mile is equivalent to almost 20,000,000 gallons. It is also essential to consider and remember that in already humid conditions, the entire evaporative process from cooling towers is completely diminished. The claim that unimaginable quantities of water could be magically evaporated from the ground to higher levels of the atmosphere during a storm when the RH (relative humidity) is already at or near 100%, goes against all known laws of physics. It is simply impossible. The cooling ponds or reservoirs that supply water for many steam generating power plants are generally not large (perhaps an acre or two of surface area and very shallow) and are supplied by conventional wells in many cases. People need to picture the amount of water that pours out of the sky which can form huge lakes, rivers, and wide scale flooding in a very short time. To believe that isolated steam cooling towers could magically put this volume of water into the sky from water sources (that are often only ponds fed by wells with feed pipes as small as 4 inches in diameter) is beyond ridiculous. Many have unfortunately mistaken the formation of large convective storms seen on radar images (not just a localized plum of steam) as being the result of cooling towers. This conclusion is patently false. We must all use our sense of reason and avoid conclusions that come from an impressive picture (or satellite loop video) without due investigation and consideration. The 60 second video below contains time lapse imagery of a convective cumulous cloud forming over a mountain range. Note that there is are not plumes of moisture coming from ground level as we are told we should see by those claiming moisture for storms is now the result of cooling towers. Water type: Although many power plants use freshwater for cooling, waste water and salt water are other possibilities with advantages and disadvantages. Salt water is an obvious and abundant option for coastal power plants, for example, but such plants face similar challenges as inland plants with regard to damaging the local aquatic ecosystems through excessive withdrawals or thermal pollution (from discharges of hot cooling water. Hey Dane quick question. What is the best way to deal with the opposition? Move on to those who want to wake up. From what I have been following, this site is a no nonsense and informative site. Way too many people are so wrapped up with such things that are meaningless. This guy that has done this to inform people is a Saviour !! I have been reading about Geoengineering and this is by far the most informative material that I have come across. Agree. Cooling towers are used for heat sinks, nothing more. They raise the humidity of the air that passes through them, but this is a tiny drop in the bucket compared to what naturally evaporates. I live in North Carolina, where there is plenty of water. A nuclear plant south of here has cooling towers despite being beside lake Wylie, on the Catawba river. It is there because otherwise the water of Lake Wylie would become too warm in the summer. Lake Wylie lies below lakes with several other thermal plants, and is fairly shallow. 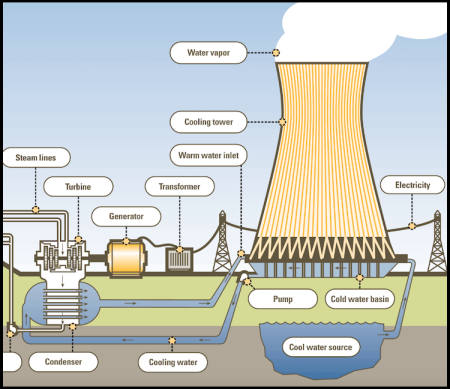 In the summer the water would be too warm for local fish, and the thermal efficiency of the power plant would suffer, so after condensing the steam, the warm water gets sprayed into the top of the cooling tower. You can often see fog rising from the top of the towers in humid weather, which is common here in piedmont, NC. No doubt, the towers increase the number of foggy mornings within a few miles of them, but this is about it. I have been making my physicians aware of chemtrails and geoengineering. They have not heard of this before and are glad for the information. Having investigated global geoengineering and its consequences for life on planet Earth, it never occurred to me that power plant cooling towers would even enter the discussion. Is there some sort of dis-information circulating about? I just realized that while i stated that the GeoEngineering is Slowly Poisoning All Planetary Life, I must add that it is dangerously decimating our ozone layer, thwarting the hydrological cycle, causing droughts and deluge, exacerbating the spread of funguses which make people sick and kill crops and plant and tree life, furthering the conditions which make algae blooms take over our waters, etc. You can’t change the PH of the planet and expect life to stay in balance. The GeoEngineering Programs Must Be Stopped. I think it is really important that we all stay the course and focus upon what we observe in our skies everyday. We see planes putting out persistent trails that turn into a complete cloud cover. We see planes leave trails that quickly disappear and yet, throughout the day, we observe that these trails have rendered the sky an unnatural silvery white with a tinge of blue. We see the aluminium, barium and strontium fallout evidenced in the many rain and snow tests that match the patents. We must be very careful to not get “too out there” with theories lest we appear paranoid. The more we entertain ideas that are truly on the periphery, the more we hurt our own legitimacy and credibility. As people wake up and want to educate themselves about the covert in plain sight government weather modification program clearly happening before our eyes, these people, new to the movement, must find legitimacy, not fringe. If they encounter fringe, they may flee. We need every awake person to stay in this fight. WE MUST, AS A MOVEMENT, AND AS INDIVIDUALS, STAND WITH EACH OTHER TO REVEAL THE TRUTH OF THESE PROGRAMS. CURRENT DIVISIONS IN THE GEOENGINEERING AWARENESS MOVEMENT ARE DAMAGING OUR CAUSE. ALL MUST THINK VERY HARD ABOUT WHAT IS MOST IMPORTANT. EGO MUST BE FACED AND SET ASIDE. THESE COVERT WEATHER MODIFICATION PROGRAMS ARE SLOWLY POISONING LIFE ON EARTH. OUR ENERGY NEEDS TO BE DIRECTED IN WAKING UP THE MASSES AND GETTING THESE PROGRAMS STOPPED. ALL OTHER ENERGY IS WASTED ENERGY.